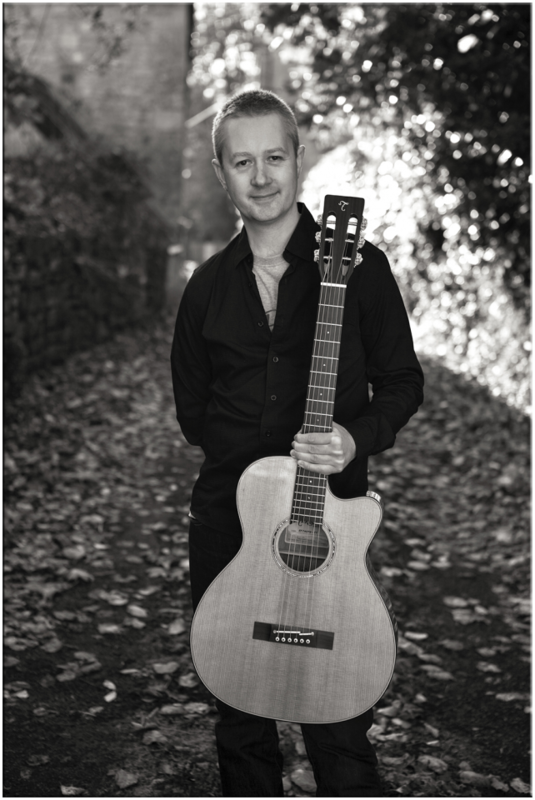 In addition to concert performances and tuition, Stuart is a busy session guitarist and has worked for many different clients from major publishing companies and pop acts to small individual project studios. His speciality is in part creation and artist emulation though he is also comfortable with notation and chord charts if you have a specific part you would like recorded. Covering all styles he is equally proficient on acoustic and electric guitars and can create anything from a subtle fingerpicked accompaniment to a soaring rock guitar solo. As more and more small studios are facing closure it’s common for today’s session players to work remotely – i.e. from their home studio – and the finished recording is then sent to the client via e-mail or secure ftp transfer. Stuart works from his home studio just outside Bath – the room is well sound proofed so you can add any processing you require at your end without an unwanted room sound. If you would like Stuart to work on your track please use the Contact page so we can discuss your requirements and our rates – we are very competitively priced as we have no studio overheads and typically work on an hourly/per track basis. Recording gear includes a Telefunken M260 tube condenser mic, A Brauner Phanthera Large diaphragm mic and a Sennheiser E906 dynamic. Stuart uses Heritage Audio and Buzz Audio mic preamps, Apogee converters and Eve Audio studio monitors in an acoustically treated room. Stuart records into Logic X and has a selection of Waves, Eventide and Kush Audio plug-ins amongst other things. He uses Fender Custom Shop and Gibson electric guitars and acoustics by Gibson and Circa Guitars, one of the most respected guitar builders in the world. You can see detailed information about his guitar equipment below. Session Details – Write and record a track in the style of modern rock artist John Mayer. Recorded at The Farm Studios, Surrey and produced by Nick Davies (Genesis, Deep Purple). This was part of a three month recording session for over 100 tracks – this demanding job required reading parts accurately, improvising solos and creating rhythm tracks/harmonies where necessary. Artist emulation was a major feature of this session. Composer – Stuart Ryan. Session Details – Write and record a piece in the style of singer/songwriter James Taylor. Stuart writes and records an acoustic column for Guitar Techniques magazine each month – the emphasis here is generally on composition and artist emulation. Composed and engineered by Stuart Ryan. Session Details – Write and record a track in the style of legendary jazz guitarist Wes Montgomery. Recorded at The Farm Studios, Surrey and produced by Nick Davies (Genesis, Deep Purple). This was part of a three month recording session for over 100 tracks – This demanding job required reading parts accurately, improvising solos and creating rhythm tracks/harmonies where necessary. Artist emulation was another feature of this session. Composer – Stuart Ryan. Session Details – Create guitar parts for a 1980’s Marcus Miller style funk track. Produced and engineered by Stuart Clayton/Stuart Ryan. Other clients include – Camilla Kerslake (signed to Gary Barlow’s Future Records), The Observer on Sunday (write/record a ‘Play Guitar’ supplement for this national newspaper), Total Guitar magazine, Guitarist magazine, The Registry of Guitar Tutors (contribute/record acoustic guitar syllabus).